Posted on April 6, 2017 April 7, 2017 . Let’s be honest, women have more clothing options than men. That said, these days men are stepping up their fashion game with colour, suit styles, shoe styles and accessories. Everything from cufflinks, the now-essential pocket square, hats and shoes are used to establish a unique expression and add an individual je ne sais quoi to a man’s everyday look. Shoes are an important part of this equation—and they’re not just brown, light brown or black anymore. Do you want a burnt orange with black toe-cap? Or a very particular shade of blue? Maybe it’s a just-perfect warm brown with a high-gloss shine that would be the perfect addition to your wardrobe. For sport shoes, NikeiD and Adidas offer custom shoe designs that can be shipped in three to five weeks. For dress shoes or Chelsea boots, you’ll need to seek out an expert leather patina artist to get that bespoke look. 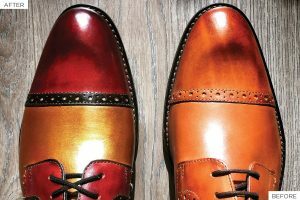 In Toronto, you can purchase a pair of shoes with a custom-made colour treatment or take your existing shoes in for a full restoration. Check out the Toronto location of French Menswear Boutique Loding, where patina artist Emmanuel Farre works his magic at the in-house patina service, Maison Patina. Not in Toronto? You can still ship your shoes to Maison Patina for service. Educated and trained in France, Farre’s exclusive process consists of transforming any genuine leather item into a customized, one-of-a-kind piece. Farre’s custom patina process can be done on raw or finished leather and takes two to three weeks to layer and set the colouring and add a high-gloss finish. 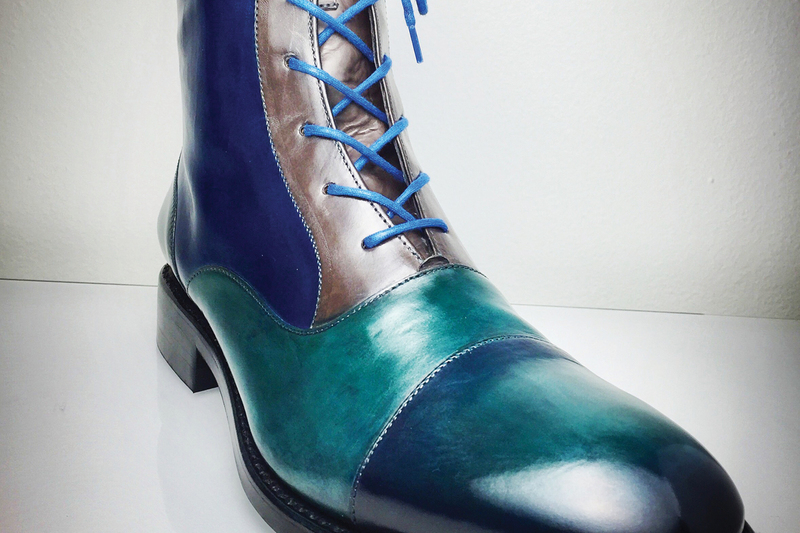 If you are buying a pair of Loding shoes, the custom patina work starts at $325; $375 if you bring in your own shoes for colouring. Shackleton Patina is another Toronto option for custom colouring. The self-taught colourist who goes by the name “Shack” has customers sending shoes from all over North America. A professional stuntman and stunt rigger by trade, refinishing shoes has always been his passion. Like Farre, Shack does careful, custom colour work on shoes and can completely renew and refinish a quality pair of shoes or boots, noting that vibrant colours are more easily achieved on light or medium-brown shoes. Refurbishing shoes with Shack starts at $250. For more information, visit Maisonpatina.com or Shackletonpatina.com.